Track time from anywhere on the web with one click. 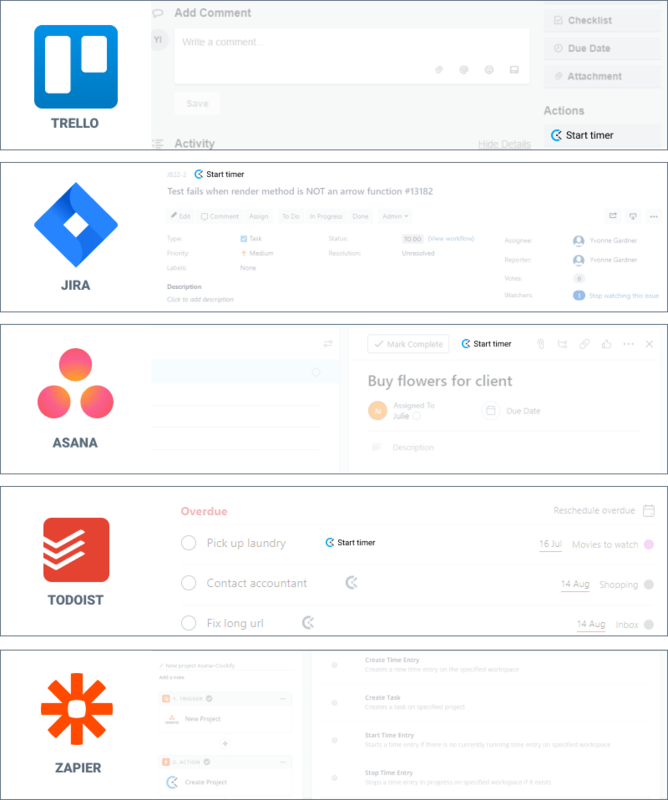 Clockify integrates with 50+ web apps so you can track time right from where you work and improve your productivity in no time. Just install the Chrome extension and a timer button will automatically appear inside other apps, letting you easily track time you spend working on tasks. Track time from cards right from Trello. Track time from to-dos right in Todoist. Track time from to-dos right from Basecamp. Track time from tasks right from Wrike. Track time from tasks right from Redmine. Track time from issues in YouTrack. Track time from task right from Flow. Track time from task right from ClickUp. Track time on tasks in Teamwork Projects. Track time from tasks right from Redbooth. Track time from to-dos in Breeze. Track time from to-dos in Wunderlist. Track time from to-dos in Clubhouse. Track time from to-dos in Monday. Track time from tasks in Zenkit. Track time from tasks in Rindle. Track time in Husky Marketing Planner. Track time from tasks and tickets in JIRA. Track time from issues and requests in Gitlab. Track time from issue and requests in Github. Track time from issues in Pivotal Tracker. Track time from work items in Axosoft. Track time from stories in Sprintly. Track time from work items in Unfuddle. Track time from issues in Rollbar. Track time from issues in Sentry. Track time from bugs in Mantishub. Track time from events in Calendar. Track time from documents in GDrive. Track time from emails in Gmail. Track time from notes in Evernote. Track time from items in Airtable. Track time from notes in Notion. Connect Clockify to 1,400+ apps. Import data from Toggl into Clockify. Track time from tickets in Zendesk. Track time from tickets in Freshdesk. Track time from tickets in Help Scout. Create invoices & payslips from time. Track time from leads in Salesforce. Track time from tasks in Capsule CRM.